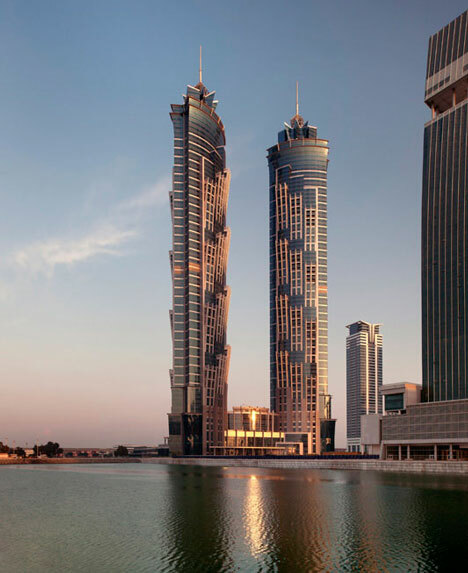 The top five tallest hotels in the world today all currently stand in Dubai in the United Arab Emirates. Even the smallest of these structures is still over 1000 feet tall. The only higher hotel in the world is the Ritz-Carlton in the International Commerce Centre, Hong Kong. This occupies floors 102-118 of the building, with the world’s highest swimming pool and bar on floor 118. Since the dawn of the skyscraper hotels have been getting taller and the views all the more spectacular because of it. So far the recently opened JW Marriott Marquis in Dubai with 77 floors stands as the tallest. There are currently five hotels in Dubai which rank as the top five tallest in the world. The Address Downtown Dubai is the smallest, at a mere 1,004 feet or 306m tall. Next up is Jumeirah Emirates Towers Hotel, 1,014ft, and then Burj Al Arab at 1,060ft. The Rose Rayhaan was until November 2012 the tallest hotel in the world at 1,092ft, but has recently been dwarfed by the JW Marriott Marquis Dubai, which reaches a whopping 1,229 feet. Dubai has made a name for itself with skyscrapers, and is also home to the Burj Khalifa, the tallest skyscraper and man-made structure in the world, which stands at 2,722 feet. When it comes to tall hotels the western world is leagues behind the east. In fact, there isn’t a western hotel to be seen in the top ten or even top fifteen. Outside of Dubai the highest hotel is currently the Baiyoke Tower II in Bangkok, Thailand. It has 85 stories, more than the JW Marriott, but only reaches 997ft in total. Next up we travel to Hong Kong in China for the Cullinan South Tower at 886ft, with 68 storeys and some of the word’s most exclusive apartments housed within its walls. At neck and neck stand the Grand Lisboa in Macau and the Lanko Grand Hyatt in Chonqqing, China, both of which top out at 846ft. The US is the only western country to even feature in the list of the top fifty tallest hotels in the world. The highest hotel it has to offer at present is the Renaissance Centre in Detroit, Michigan at 727ft (750ft including antenna spire). The complex itself consists of a group of seven interconnected skyscrapers, with the central and tallest structure in the centre being given over to the Detroit Marriott. Erected in 1977 by the Henry Ford motor company, the building features the largest rooftop restaurant, Coach Insignia, above a stunning array of shops, restaurants, cinemas, banks and more. Hotel beds here go from $179 per person per night. This post was written on behalf of Hotelcontractbeds.co.uk – helping you get the best nights sleep possible with their selection of folding beds & mattresses.